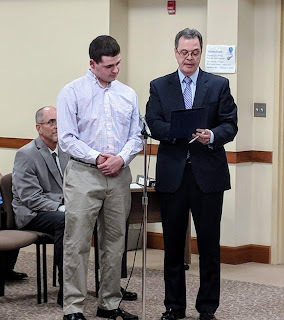 Special recognition for James Pentikis, a student at FHS, for his work helping to prepare the FY 2019 budget documents. The annual committee and board appointments for the new fiscal year was approved after an amendment to remove the appoint of the ZBA member. A new assessment of candidates for this position will be taken before bringing the appointment back to the Council. A long listing of legislation was approved, some for final approval and some for referral to the Planning Board. The complete listing can be found in the notes and Actions Taken document below. The final approvals for the remaining free cash allocations will be on the next agenda. Approx. $500,000 remains after the snow/ice shortfall was covered. This remaining money would likely be used for other items on the Capital budget not funded in the first round earlier this year. The proposal to address the parking problem caused by the Dean College students is also supposed to be on the scheduled for the next meeting.